The usual story told in history books is that after Jutland the German High Seas fleet ran home with it's tail between it's legs. Then it did nothing until 1918 when the staff had decided that it would go down in glory in a last ditch suicide sortie. At that time the sailors mutinied much like the Russian sailors had at Kronstadt. It seems like the real story because it has been told so many times. Unfortunately it is nowhere near the truth, and thankfully Gary Staff has written this book to put the story straight. This is the story of the 1917 German attack on the Islands, which are near the Gulf of Riga. This history of the German combined arms attack on the Baltic Islands should be a blueprint for other military history books. The book itself is less than 200 pages, but it is filled with maps (14) and has sixteen pages of photos (40 photos). The maps are some of the best I have seen in military books that were not an atlas. The author tells the story of the campaign from the smallest mine sweeper to the various battleships involved. The land fighting and the forces used there have not forgotten by the author. It is a tale of a very well planned and executed amphibious operation on the Germans' part. 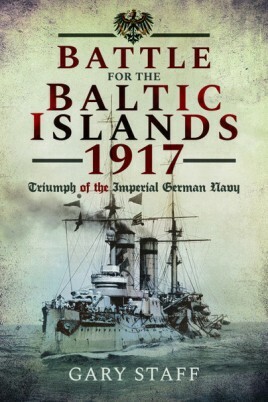 This book should put paid to the idea that the German fleet sat like a cur for the last two years of the war. Thank you Mr. Staff for writing this book. Your attention to detail in your books is much appreciated. I look forward to any other books you have planned. This book should be on anyone's shelf who has the slightest interest in the naval warfare or WWI.